It’s one thing to know what a chord is. It’s quite another to know how to use chords in music. Traditionally, chord use has been studied via the discipline of “part-writing”—the craft of creating rich harmonic textures from individual (usually sung) lines. Although it is confusing to some—not everyone finds this approach intuitive—there is much to be said for it: it is both well-known, and deeply reflective of music history. 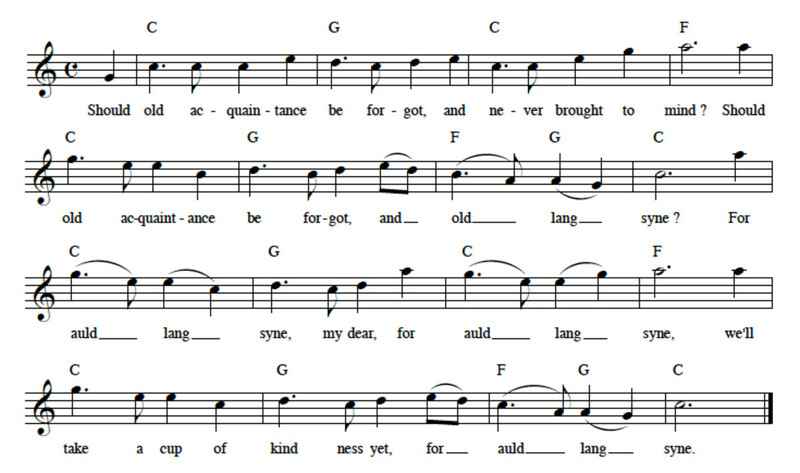 Example 1--Lead sheet for "Auld Lang Syne." There are many correct ways to ‘realize’ this lead sheet, but some will sound better than others. 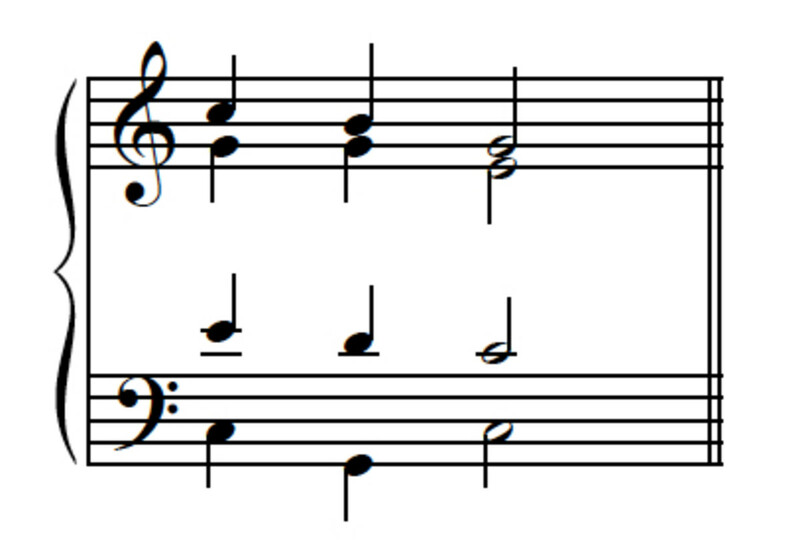 The first is one of the ‘others.’ In it, the left hand of the piano has simply been given a simple three-note ‘triad’; the bottom note is always the ‘root,’ the note after which the chord is named. 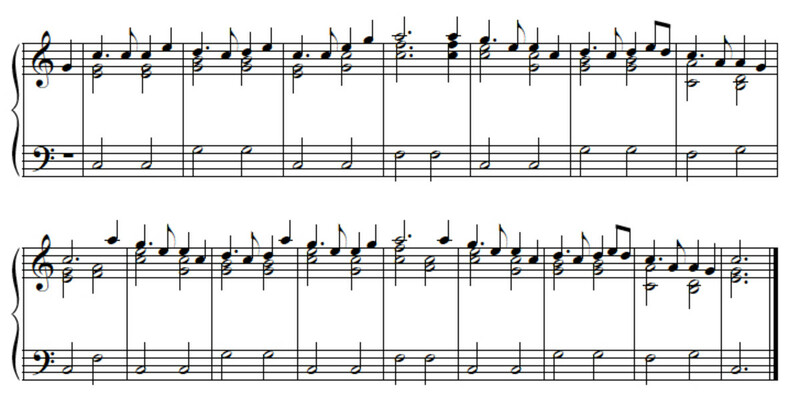 Example 2--Simple Realization of lead sheet. The result sounds clunky and simplistic. There are couple of reasons for this. One is that the constant use of chords in ‘root position’—that is, chords with the root as bass note—and with the same voicing (the arrangement of notes above the bass)—means that all the notes of the chords are locked into the same relative positions. Thus, they always move in the same fashion. A second reason for the clunky sound is that the left hand’s notes are very close together, while a much greater space exists between the left hand and the melody itself. For example, in the very first measure the left hand has three notes within the span of a fifth, but there is then an empty octave plus a fourth between its upper note, 'G', and the 'C' in the right hand. 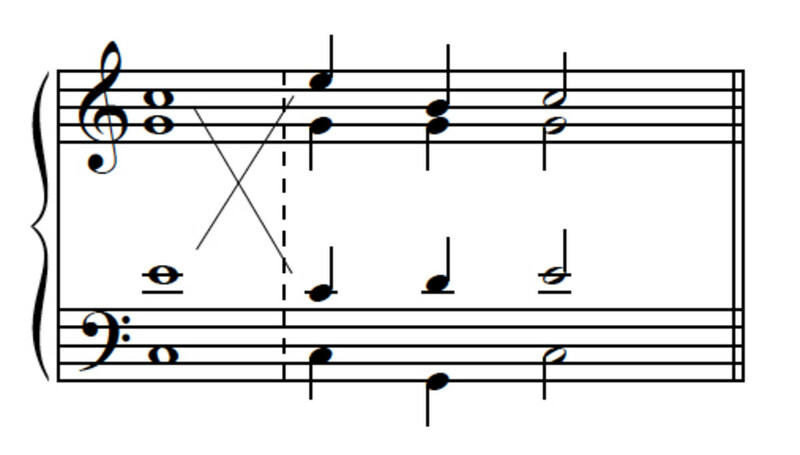 In this version, the harmony notes supporting the melody—call these the 'inner voices'—are moved higher, while the bass notes are held lower, resolving the spacing problem. The result is a sound that is brighter and more focussed. 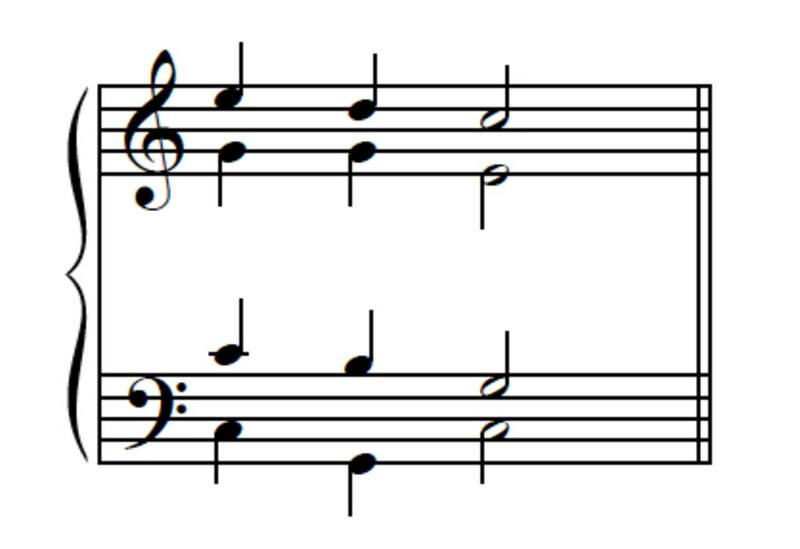 The accompaniment recedes into the background, allowing the melody to 'shine.' The bass, too, is heard more clearly, and better supports the melody—even though it hasn't changed in itself! The harmony notes also move in ways that are at once more economical and more varied. They are more economical in that they jump much less, moving more often instead by 'step'—that is, from one note to an adjacent one. (This stepwise motion makes them much easier for the listener to follow, and in the case of actual vocal parts, much easier to sing, too.) They are more varied in that their relative motion is sometimes parallel, sometimes similar—moving in the same direction but not the same distance, and sometimes contrary—moving in opposite directions. The final version offers further improvements. We won’t go into the details at this point, other than to say that the bassline is more independent than before, maintaining a constant, even rhythm that helps propel the music forward. Let’s move our focus in a bit tighter now, and look at the single most important progression in traditional harmony: the progression from tonic to dominant and back. But what do “tonic” and “dominant” mean? As described in Chords in keys, diatonic chords fall into standard patterns which are the same from key to key. Labeling chords according to their place within the scale gives us a convenient way to discuss these patterns. Example 5--Tonic and Dominant chords in the major scale. Note that it is conventional to use Roman numerals to symbolize chords. Each scale degree has its own sound or ‘personality.’ The tonic scale degree feels stable; it is the normal final tone of conventional melodies, and signals finality or closure. By contrast, the dominant scale degree is unstable and conveys activity or energy. Similar qualities would apply to the tonic and dominant chords built upon those scale degrees. Because these chords mark the normal extremes of harmonic tension and relaxation within a key, classical harmony has made tonic and dominant its two most important and frequent chords. There are many lengthy passages in Classical music using tonic and dominant harmonies exclusively, or nearly so. So, how do tonic and dominant connect in traditional part-writing? That is, how do you use these chords in creating a harmonization, or a melody? Example 6--I-V-I, "neighbor note" version. Even smoother is the tenor voice, which never moves away from scale degree 5. In traditional part-writing, this is called ‘keeping the common tone,’ since the ‘G’ is common to both I and V chords. Keeping the common tone is considered a desirable thing to do, but it’s not always possible--not all chord progressions have common tones, as the tonic-dominant progression does--and as we'll see, even when a common tone exists it's not always possible to maintain it in the same voice. Finally, the bass voice outlines the roots of the chords. As such, it must leap; stepwise motion is not available to it, since the roots of the tonic and dominant chords are always a fourth (or fifth) apart. So in real music the bass line often leaps much more than the other voices. In summary, we have four lines: 1-7-1; 3-2-3; 5-5-5; and 1-5-1. These lines, and variants of them, will be seen in many different settings. But there are other possibilities as well. The following example shows a more 'directional' realization of the I-V-I progression. Example 7--"Passing-tone" versions of I-V-I, correct and incorrect. 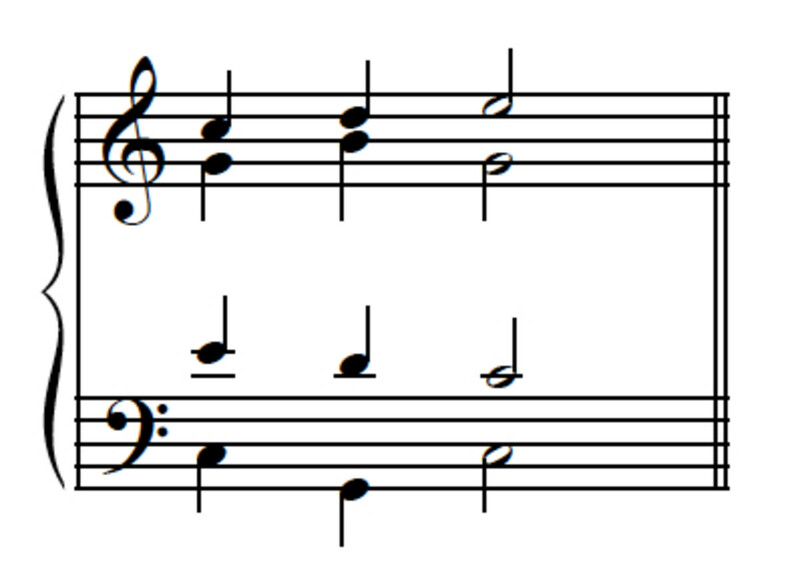 In this version, the scale segment 1-2-3 replaces the more static 1-7-1 in the soprano line, creating a very different character: the soprano seems to drive upwards. 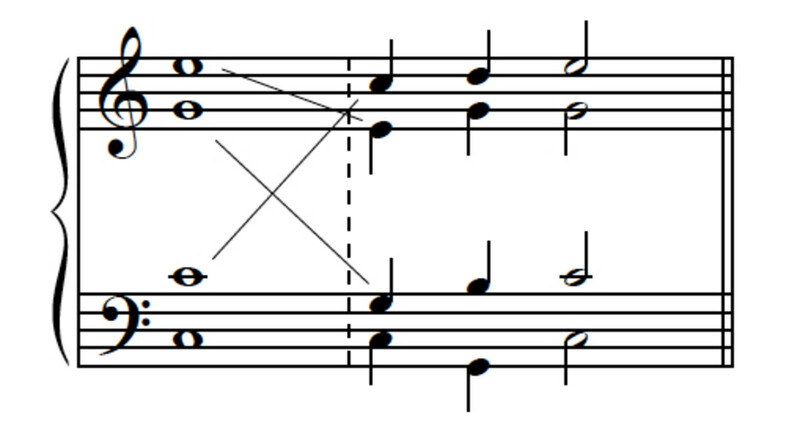 This 'driving' soprano line forces adjustments to the alto and tenor lines, however: if we were to retain the ‘common-tone line’, the 5-5-5, we would run into spacing problems, as shown in the “incorrect” version on the right. (Try to hear the difference--though it may not be obvious to all listeners at first. But the badly spaced chords do not sound as well-blended and smooth; the tenor line tends to ‘jump out’ of the texture.) So our alto line becomes 3-5-5, and our tenor, 5-7-1. Interestingly, it’s possible to convert version two into something close to version one by ‘re-shuffling’ the first chord, as shown in below. The soprano note, 'C,' would move into the tenor voice, one octave lower. The alto and tenor notes would be shifted up an octave, and into the soprano and alto voices, respectively. As we will see later, this idea of shifting lines, or parts of them, between voices can be a useful trick. Example 8--Converting "passing-tone" version into "neighbor-tone" version using voice exchanges. Example 10--Passing-tone version with exposed leading-tone (LT in the soprano.) Not good! Did you feel slightly uncomfortable during the prolonged B? If so, you have learned to expect the resolution of leading tone to tonic. Most listeners don’t mind the frustration of unresolved leading tones when they are hidden away in inner voices, but find them more troubling when found in the soprano voice (where they are heard most clearly.) That means that the awkward 1-7-5 soprano line of Example 9 should only be used in alto or tenor voices—and in fact choral Altos and Tenors get to know this line quite well, but Basses and Sopranos not so much. Example 12--Passing-tone version in contrary motion. Notice how the tenor line, 1-2-3, not only moves contrary to the soprano, but actually reverses it. One feature of this version is that it moves from what is called an “open spaced” chord—one in which the upper voices are spaced in fifths and sixths—to a “close spaced” chord—where the voices are separated by thirds and fourths. This version can be reversed by swapping soprano and tenor lines, as shown below. Another feature of Examples 12 and 13 is that they each require a different “doubling” of the dominant chord. “Doubling” refers to the fact that when one distributes the three possible chord tones of a triad—root, third and fifth—among four voices, one chord tone will need to appear twice. In previous examples, the root of the triad has always been the doubled tone. 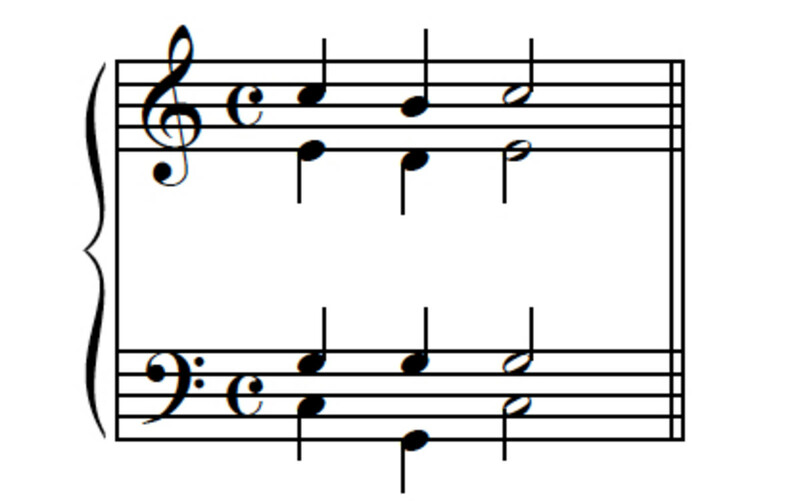 In this example, by contrast, the doubled tone is the fifth of the chord. Does this create problems? Well, to answer a question with a question, did you notice the difference, until it was pointed out in this paragraph? Example 14--"Leaping line" version of I-V-I. This is less common, perhaps because it involves a larger leap in an upper voice than we have seen before. Larger leaps have traditionally required more careful melodic treatment than have skips or steps, and have therefore been used more sparingly. 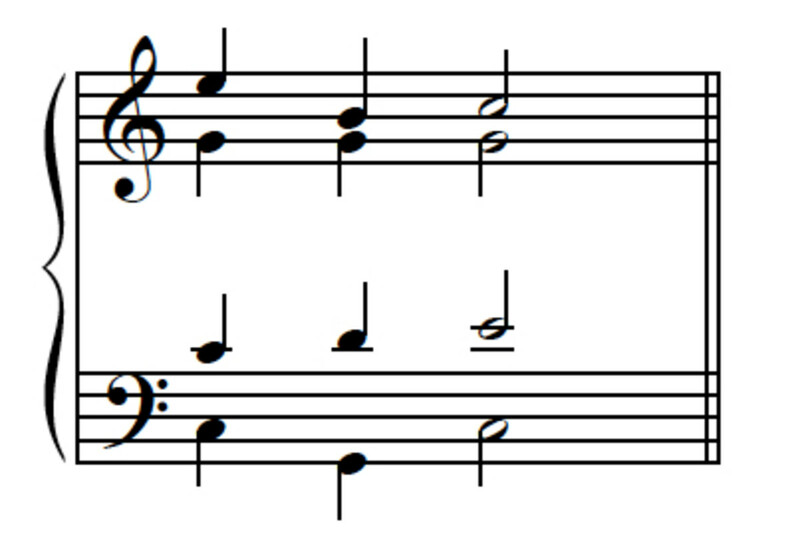 This soprano line is a good example of the traditional melodic treatment of leaps: the energy of the downward fourth ('E' to 'B') is compensated by an immediate stepwise 'turning-back' ('B' to 'C.') Sometimes you see this version, reversed—1-7-3—in an inner voice. 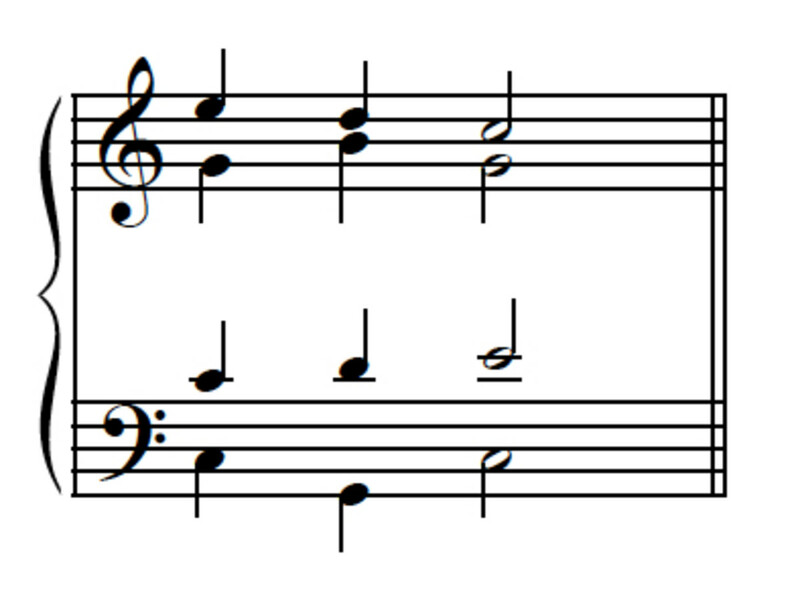 Example 15--I-V-I with leaping soprano, and its conversion to neighbor-tone version via voice exchanges. Fun but not really frivolous--join (or start) a conversation at snowonmusic.com! Let’s sum everything up once again. You can ‘mix and match’ these lines to create different combinations, each possessing a slightly different sound or character--though not all lines go together without creating problems in doubling, spacing or voice leading. It’s a lot easier and more efficient to take this positive example-driven approach to part-writing than to take the traditional ‘rule-driven’ negative approach. But skill is the product of practice much more than of just understanding--it takes practice, too. Not so coincidentally, the next Hub in this series gives you a whole set of practice exercises to work through. Check it out to build your skill in applying what you've just learned here! This companion to "Part-Writing Chords: Tonic And Dominant I" has practical exercises to build skill in part-writing tonic and dominant chord connections. Get to know I-V-I in many different keys and different voice leadings, one click at a time. Thanks, hh! Always a pleasure to hear from you! I think it was well writing. Very explanatory and clear. Thank you. Thank you so much, guys! The videos are a lot of work, so I'm glad the result is helpful. This is an excellent hub. I think it strikes exactly the right balance you were looking for. It's impressively informative while also being clear and interesting. I hope you found this Hub a useful introduction to part-writing--one that strikes the right balance between too much detail, and not enough essential information. Let me know! The plan is to continue on with practice Hubs and additional harmonic vocabulary. Is that something you might find interesting? If not, what would you like to know about music and music theory? Thanks for reading this far--and special thanks to those who offer feedback below!